Dynamic components such as rotor blades must be flight tested as part of the FAA Supplemental Type Certificate (STC) certification process. 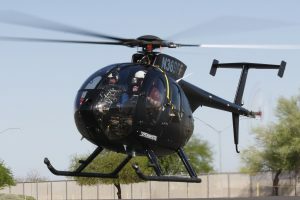 The first step is often flying the test helicopter with original equipment manufacturer (OEM) parts to obtain baseline data for that particular helicopter. Flight test personnel spend several weeks placing strain gauges on the blades, rotor hub, pitch links, and other critical components. The strain gauges are connected to a robust data acquisition system that can receive data from up to 30 channels at a time. Wind, temperature, pressure, and other data probes are installed on the aircraft. 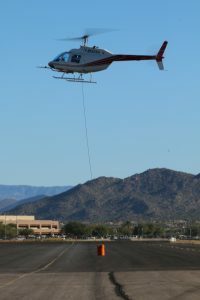 Once the aircraft is instrumented, the test pilots run the helicopter through a series of maneuvers and lift tests. After the baseline testing is complete, the test personnel remove the OEM blades and install instrumented VHA blades. After track and balance of the newly installed blades is complete, a test pilot and flight engineer conduct a series of ground tests at various rotor RPMs. A strobe light highlights the blades tip during ground tests to watch for tracking issues. If everything looks good, the pilots begin a series of hover, in ground effect (IGE), and translational lift maneuvers. The strobe continues to be used in hover and IGE testing to watch blade patterns. As confidence in the blade design grows, the test pilots begin maneuvers out of ground effect (OGE), hitting various speed, altitude, gross weight, and “g” data points. Some of these data points are compared to those collected in baseline testing. The tests conclude with auto-rotations from various heights. While we can complete most of our flight testing at nearby Falcon Field in Mesa, Arizona (field elevation 1395 ft), some data points must be collected under certain density altitude conditions. Flagstaff, Arizona (elevation 7094 ft) and Leadville, Colorado (elevation 9927 ft) provide good bases for high-altitude testing. If we need sea level conditions, we’ll travel to Thermal, California (elevation -114 ft). Visit our YouTube Channel to see more flight test videos!